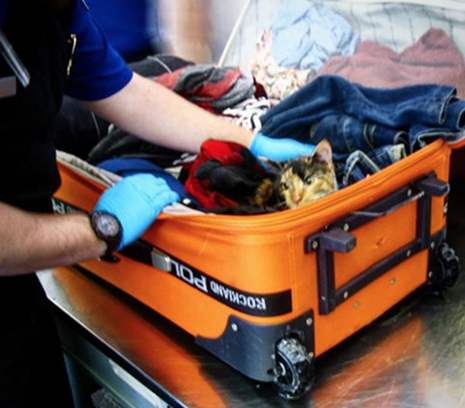 JANUARY 12--A Florida couple has been charged with animal cruelty after airport security officials discovered that they had placed their six-month-old cat inside a piece of checked luggage at a Pennsylvania airport, court records show. 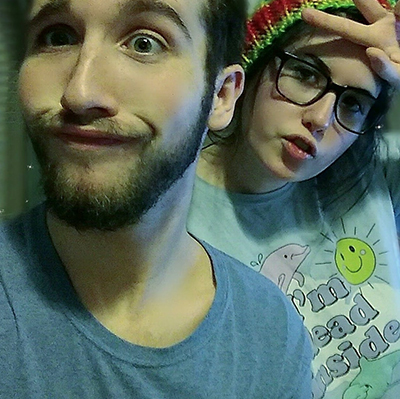 According to investigators, Olivia Sari and Nicholas Larrison, both 21, had visited Pennsylvania over the holidays and were set to return to their Tampa-area home on January 1. The couple, flying from Erie International Airport, checked a piece of luggage that triggered an alert from the airport’s baggage inspection system. The flagged bag was then opened and searched by Transportation Security Administration agents, who discovered the kitten. Named “Slim,” the female cat was packed alongside clothing and was “without food, water or air,” according to court citations. The animal was turned over to the local Humane Society upon its discovery by TSA workers (one of whom snapped the below photo of "Slim"). Pictured above, Sari and Larrison were each cited for transporting animals in a cruel manner. They have not entered pleas, according to District Court records.